Location: Fremont Central Park at the corner of Paseo Padre and Sailway Dr., in Fremont. It is that time of year when SBARA members and their families get together for some annual fun radio activity and a yearly nationwide emergency communication exercise. 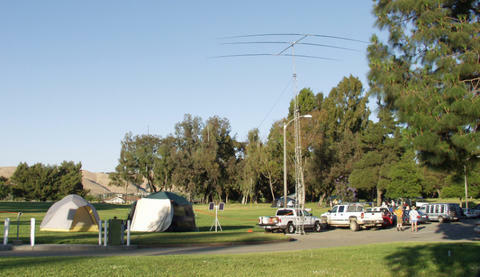 ARRL has mentioned that over 35,000 hams from various parts of USA and Canada will be setting up communication stations to test and improve their emergency skills. Contact the FD Coordinator with your request to operate. SBARA has permission to camp overnight and this has become a fun part of the weekend. So, bring your tent and stake out a spot to join in the camping experience. We will be located in Central Park near the intersection of Paseo Padre Pkwy and Sailway Drive. Guests are welcomed to operate the emergency stations under the supervision of a control operator. As is our tradition, setup will begin on Friday, the day before Field Day, starting at 10:00 AM. Every member is asked to participate in the setup since this is a key part of the practice. The operating will begin at 11:00AM on Saturday, ending at 11:00AM on Sunday. Members and guests are encouraged to sit at an operating position and learn how to log a contact and then try to make one contact to round out their learning experience. Sunday, June 25th - Breakfast for the overnighters, then the operating continues until 11 AM. Tear-down begins at 11 AM and ends around 2 PM, all extra hands will be appreciated ! Don't forget to get lounge chairs or picnic blankets for you & your family ! The SBARA Field Day planning and dicussions will be held at the June SBARA club meeting. You will be able to learn all the details and participate in the activities. You are encouraged to ask questions, especially, if this will be your first Field Day. P.S. : There will be many Field Day activities where a little help will be much appreciated. Contact the FD Coordinator, Al Rendon, WT6K to find out more about how you can help with the Field Day activities for SBARA.